Ready to invest in new skydiving gear? Have questions you want answered before ordering? View the FAQs below to find answers to the most frequently asked questions about our rigs and skydiving gear. Can't find the information your looking for? Contact us, our team would be happy to answer any of your skydiving equipment questions. 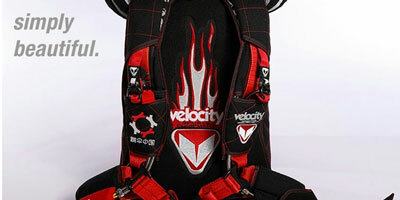 Does Velocity Sports Equipment offer expedited services? What wingsuiting options does VSE offer? What Freefly options do you recommend? Does VSE offer camo colors or can I send in my own fabric for the container? What is a party pocket? How do I order a Liquid Sky Infinity? Do you offer student options? Do you offer a semi-stowless deployment bag? What AAD's can I put into an Infinity? We can rush a rig through at 4-6 weeks for an additional $300. Check the home page on our website to see if that option is available. Yes. We offer 15% off base price on a new custom Infinity with proof of active service, USPA card & military ID. We highly recommend hip articulation with the floating laterals and our semi-stowless deployment bag (Party Bag). We do offer many different camo colors. These colors are available to view in our 3D designer. The skydiver orders the container through their preferred dealer, and writes "Liquid Sky Design" in the special instruction section on the order form. Once the order has been confirmed, the customer will work directly with Julio of Liquid Sky Sports to create their custom design. The jumper will pay Julio the customization fee separately and pay the dealer for the container. We will charge an additional $200 on our invoice to the dealer. Want to see some of the LiquidSky Design Infinity sexiness? Check it out here! Yes, we offer an AAD window, adjustable harnesses, telescoping legpads (we can do small/medium/large harnesses as well), AFF Hinged BOC pocket/handle, and we can set them up for Static Line and/or SOS as well.